Join the latest trend on how people are starting to heat and cool their homes. Heat pumps can efficiently warm up and cool down your home on the days that do not demand the high power of a traditional furnace or air conditioner. Depending on if it’s winter or summer, think of a heat pump as a way to constantly move hot or cold air from one place to another, when you need to. Even in places like western Wisconsin and eastern Minnesota when the air seems too cold in the dead of winter, heat energy is present. When it’s cold outside a heat pump extracts this outside heat and transfers it inside. When it’s warm outside, it reverses directions and acts like an air conditioner, removing heat from your home. With SEER ratings up to 19 and HSPF ratings up to 9.7, heat pumps consume energy responsibly while providing superior comfort and quiet operation. Our heating and heat pump professionals will guide you through the heating installation process and help you choose the perfect American Standard or Mitsubishi Electric heat pump that best matches your heating needs and falls within your budget. SEER stands for Season Energy Efficiency Ratio and applies to central air conditioners and heat pumps. The minimum set by the Department of Energy is 13 SEER and for Energy Star, 14 SEER. The higher the SEER, the greater the energy economy. Heat pumps use Heating Seasonal Performance Factor (HSPF) as their measurement. The higher the HSPF, the greater the efficiency and the greater your energy savings potential. 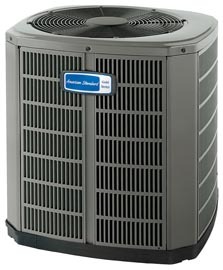 At Richter Heating & Cooling, we only install American Standard heat pumps. Why? We could tell you American Standard products are the most dependable in the industry, but it’s so much more believable when others do it for us. Readers of a national product testing and research magazine rated American Standard’s heat pumps as the most reliable brand among leading manufacturers. Click here to see the full line of American Standard heat pumps. Contact Richter Heating & Cooling today to learn more about our heat pump products or to get a FREE estimate. Call 715-557-0583 or complete our online Request FREE Estimate form.